When asked that question, many kids tend to rattle off professions such as doctor, lawyer, firefighter, policeman, teacher, entertainer, professional athlete or a job that someone has that they see on a regular basis. There is something about the possibility of seeing their dream become a reality that motivates little children and gives them the hope and excitement that their dream will one day become true. For Clarence McKinney, affectionately known as “Bug” by those who know him, growing up in Houston’s Third Ward, he knew he always wanted to be a stellar athlete. But after experiencing success at Ryan Middle and Jack Yates High School, he also knew that one day he wanted to be a coach. Not only has that dream of coaching become a reality for McKinney over the years, he recently added another major milestone to his overall coaching career that has created a significant buzz in the Greater Houston area, across the country and in the world of historically Black college football. On December 3rd, McKinney, 47, was named the new head football coach at Texas Southern University (TSU), replacing former coach Michael Haywood, who recently announced his resignation after three seasons with the Tigers. Haywood finished those three years with an overall 8-25 record and a 7-16 record in the Southwestern Athletic Conference (SWAC). 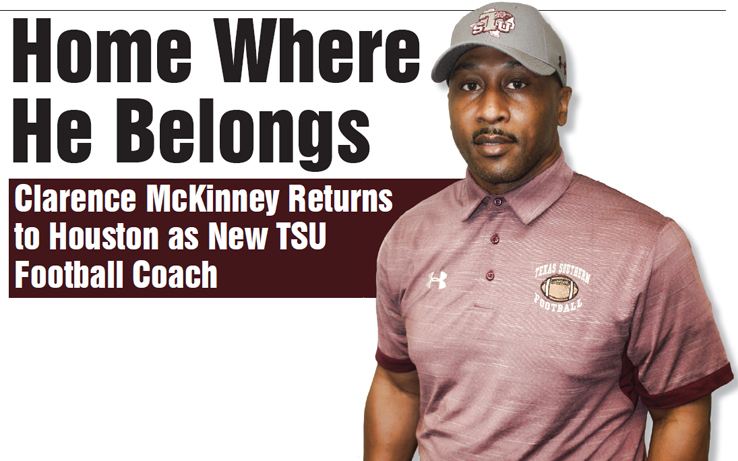 Becoming the head coach at TSU is a dream come true for McKinney, who played quarterback across the street at Jack Yates High School in the late 1980s, and who simply got into coaching in order to help young men become successful in life. Now, he is about to bring that same mentality to one of the most storied historically Black colleges in the country. 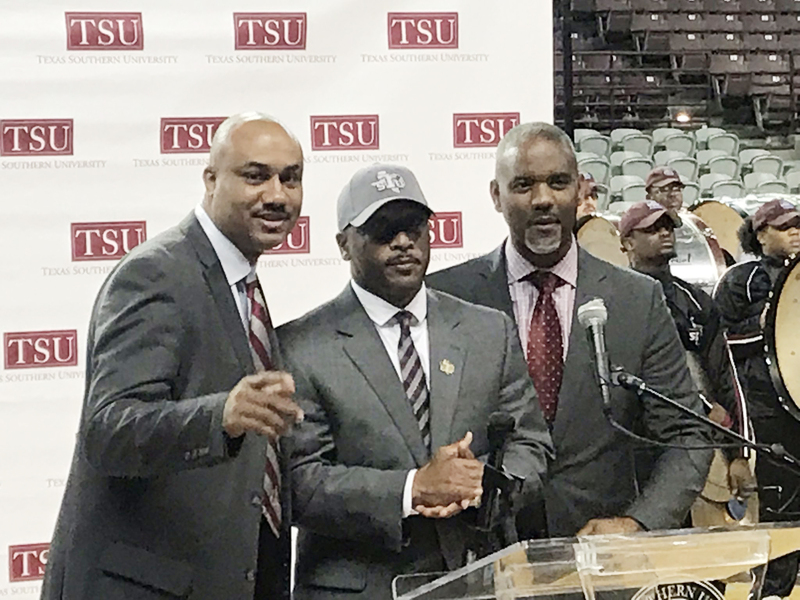 The leadership at TSU couldn’t be more excited to welcome McKinney aboard as their new head football coach, and expressed that very sentiment at a press conference held this past Monday. TSU President Dr. Austin A. Lane is also excited about McKinney leading the Tigers football program into the future. McKinney brings a ton of experience with him to a Tigers football program that is in need of a pick me up after several straight losing seasons. After graduating from Yates High School in 1989, McKinney went on to play football for three seasons at Montana State, before transferring to University of Mary (ND) where he received a bachelor’s degree in elementary education in 1994. He later earned a master’s degree in educational administration from Prairie View A&M in 2002. McKinney began his coaching career at some Houston area junior high schools before becoming the quarterbacks coach at Jack Yates High School in 1996. In 1997, he was hired at Booker T. Washington High School and served as an assistant coach until leaving to become the assistant football coach at North Shore High School in 2003. In his first season at North Shore, McKinney was named the 2003 Houston Coaches Association Assistant Coach of the Year. After experiencing success at North Shore, McKinney was hired back as the head football coach at his alma mater, Jack Yates. McKinney compiled a 30-8 record at Jack Yates and received several accolades, including being named a 2006 Gordon Wood 4A Coach of the Year Finalist. As McKinney continued his upward climb in the coaching ranks, he ran across another talented coach while he was coaching at Booker T. Washington High School, who was on the rise. That talented coach was Kevin Sumlin, who at the time was the wide receivers coach at Purdue and regularly recruited players from Texas. Sumlin eventually became the coach at the University of Houston (UofH) and hired McKinney to be his running backs coach and recruiting coordinator. McKinney’s time at UofH was highly successful as the Cougars compiled a 36-17 record and played in three bowl games. University of Houston posted double-digit wins twice during his stay, including 2011’s school-record 13 victories and bowl triumph over Penn State. After serving under Sumlin for four seasons at UofH, McKinney followed Sumlin to Texas A&M, where he served as the running backs coach for six years. In 2016, the Aggies produced one of its greatest rushing seasons under McKinney’s direction. In addition to his running backs coach duties, McKinney served as the Aggies’ offensive coordinator and play-caller for the 2013 Cotton Bowl and the 2013 regular season. Under his leadership, the Aggies led the SEC in passing, scoring and total offense, while setting school records for passing yards, touchdowns and completion percentage. Upon leaving Texas A&M, Sumlin once again brought McKinney with him to the University of Arizona, where he served as the associate head coach and running backs coach until being offered the head coaching job at TSU this week. McKinney admits there is a lot of work that needs to be done, and he has already hit the ground running to make that happen. McKinney states that some of his immediate major priorities are getting his coaches hired, focusing on recruiting players, and getting to know the current players on the team and learning what they do well. As a matter of fact, in visiting with McKinney the day after the big announcement, he informed the Forward Times that he had already gotten his first major recruit from the Greater Houston area to commit within 24 hours of being named the new TSU football coach. McKinney is hoping to get major support from the community and the alumni, and he hopes everyone fills up the stands to watch a great group of young men play with great effort. With a new coach and a new vision for winning, TSU may very well see the community and alumni step up to support the TSU football program sooner than later. 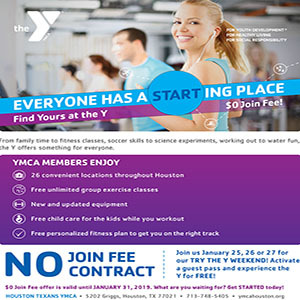 Congratulations coach McKinney and welcome back to Houston’s Third Ward!